925 Silver 8-9mm White Pink Purple Freshwater Cultured Rice Pearl Bracelet 7.5"
FreshWater Pearl Bead Bracelet With Angel Charm. Condition is New with tags. Dispatched with Royal Mail 1st Class Large Letter. Solid 925 Sterling Silver 6mm Cultured Freshwater Pearl Torque Bangle Bracelet - Gift Boxed. Beautiful and Elegant Solid 925 Sterling Silver Torque Bangle. Features a curved, high shine polish silver finished off with two round freshwater pearls at each end. Style: ChainLength: Less than 7"
FreshWater rice Pearl Bead Bracelet With heart charm . Condition is New with tags. Dispatched with Royal Mail 1st Class Large Letter. FreshWater Pearl Peach Colour Bead Bracelet With Angel Charm. Condition is New with tags. Dispatched with Royal Mail 1st Class Large Letter. Sterling Silver Freshwater Pearl Bracelet. Complete with gift box. Delicate Silver Triple Strand Chain and Pearl Bracelet, that makes a charming accessory for any occasion. Three natural pearl bracelets - wear all three together, on elastic so will fit a variety of wrist sizes, could be restrung with silver beads or wire. Metal: Silver PlatedStyle: BeadedLength: 7 - 7.49"
This is a really lovely white freshwater pearl adjustable bracelet. Stamped 925 on the back. Pearl is the birthstone for June. The colour of the pearl can also be further enhanced with bleaching and dyeing, allowing producers to make pearls in a range of colours available". Freshwater Pearl Double Bracelet with S/Silver Filigree Clasp & Crystal Cross. Brand: HandmadeLength: 7 - 7.49"
Metal: Silver PlatedStyle: ChainLength: Less than 7"
Metal: Silver PlatedLength: More than 10"
3 White Baroque Freshwater Pearls Free gift bag. Lovely Gift. 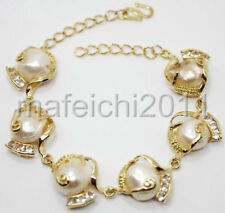 3 White Baroque Freshwater Pearls Free gift bag. Lovely Gift.. Condition is New with tags. Dispatched with Royal Mail 2nd Class Large Letter. Brand: HandmadeLength: 8 - 8.49"
This has a silver lobster clasp - silver mark on the lever. A gorgeous bracelet with the most amazing depth of colours. It would make an ideal present at a bargain price. This is new and unworn. Approximate length is 8". Collection station availableBrand: UnbrandedLength: 7.5 - 7.99"
This collection is handcrafted designs double string of white freshwater pearls. This is simply by gorgeous pretty of genuine AAA freshwater cultured pearl which is imported from ". Pearls approx: 7mm x 10mm. 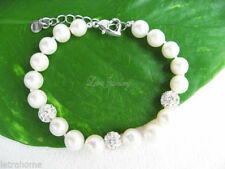 NEW- GENUINE FRESHWATER PEARLS & SILVER PLATED BRACELET. 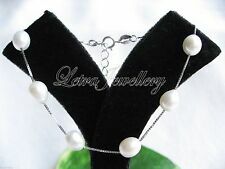 Natural Genuine Pearls, 6 / 7 mm wide examples, Silver plated chain, bolt clasp. Freshwater Pearls and Rose Quartz Double Strand Bracelet. A beautiful double stand bracelet using 6mm - 8mm Freshwater Ivory Pearls and Rose Quartz Chip Gemstones. They wash out toxic energies and emotions that you have trapped inside of you. 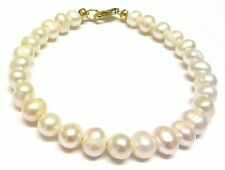 100% Genuine Money Back Guarantee Free UK Delivery 100% Genuine High Quality Fast Shipping 9ct Gold White Freshwater Pearl Bracelet Exceptional handcrafted 9ct yellow gold white freshwater pearl bracelet. The bracelet features a 9ct gold clasp which is stamped 375. 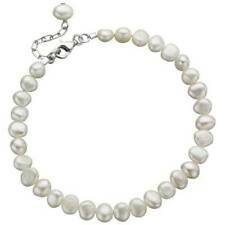 The white pearls are 7 mm in diameter, and the length of the bracelet is 7.5 inch / 19 cm. This gorgeous bracelet is great for all occasions. It would make a lovely gift or a treat for yourself. All jewellery comes gift boxed. ​​​​​​​Pearls Payment by PayPal is preferred as this is a secure and easy way to complete our transaction. Please make payment within 7 days of purchase. We offer free shipping on UK orders only. All items are dispatched within 24 - 48 hours of receipt of payment. Collection station availableMetal: Yellow GoldStyle: BeadedLength: 7 - 7.49"
Collection station availableMetal: Yellow GoldStyle: BeadedLength: 7.5 - 7.99"
Freshwater Pearl Bracelet with S/Silver Cat Charm and S/Silver Stud Earrings. 925 sterling silver multi coloured genuine baroque freshwater pearl bracelet 7. Handcrafted by myself is this lovely 925 sterling silver genuine baroque freshwater multi coloured 7.5" bracelet, pearl knotted using the finest silk threads. For all those special occasions, wedding, proms, or just as a gift. Freshwater Pearl & Czech Beads Bridal Bracelet S/Silver Clasp & Stud Earrings. 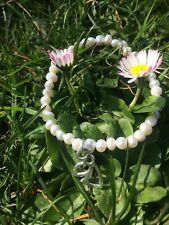 9-10MM white baroque freshwater cultured pearl bracelet 7.5-8"
Sterling Silver Fresh Water Pearls & Hearts Charm Bracelet on Belcher Chain 8"
8-9mm Genuine Natural White Akoya Freshwater Pearl Stretchy Bangle Bracelet 7.5"